The past three days I've spent at Yosemite National Park. I was very impressed. They have beautiful tall redwood trees everywhere, tall waterfalls, crystal clear rivers, and more rock formations than you can shake a stick or any other large pointy object at. We didn't have reservations, but we were able to find the nicest camp site of any there at a small backpackers camp just north of a main camping area, complete with running water and flushing toilets! Many people book their site a year in advance and don't get anything as roomy or convenient as our site. The down side was that we had to hike with our stuff about a mile from where we parked, but we packed light enough that it wasn't a big issue. Our first day there we went to Lower Yosemite Falls for some swimming and site seeing. There was excellent bouldering to be had at the falls, it took us about 20 minutes at a leisurely pace to work our way up to the base of the falls. The water at the falls is cold. REALLY cold. After being in the water for about 15 minutes the best I felt was stinging pain all over my body. What was most surprising was that the water was at least 8 feet deep in places, but I could see all the way to the bottom. This is something I'm not accustomed to coming from MN lakes. We sunned ourselves on the rocks for about an hour while watching the climbers work their way up the cliff face next to the waterfall, then headed back to camp for the evening. As far as hiking goes, Yosemite has it all. Anything from leisurely hikes/drives to see the more well known sites to multiple week/month hikes to experience the park first hand. Our second day there, we chose to do the trail to Half Dome, which was the only trail listed as "Extremely Strenuous", the most difficult designation for the Yosemite trails. The plan was to make a day hike out of the 19 mile (from our campsite) round trip journey so we left camp at 7:00 a.m. We soon learned why the trail was designated extremely strenuous. The entire 8.5 miles from the trail head was uphill. At times there were stairs which stretched on for miles, and other times simply a steep dirt and rock trail leading us through the woods. The scenery was majestic. We passed by two waterfalls, various streams, rivers, and gorges which thirsted for the blood of hikers. At the half way point to Half Dome, we ran into a group of hikers that informed us the final leg of the hike was closed for construction until 4:00. We weren't very pleased since this new development put us 5 hours behind schedule, but were determined to finish the hike. Two hours and 6 sore legs later, we made it to the base of Half Dome. We hung out for 5 hours waiting for the construction workers to finish their shift so we could start up the trail. They were adding stone stairs to the dome, something that didn't seem necessary, but I can see how it would be nice to have. About an hour of our time was spent talking to the ranger guarding the trail. It is amazing the stuff you learn when talking to these rangers. Apparently since national parks are under federal jurisdiction they need their own court house and jail, all of which are within the park. When we asked about a man who died in the park a month prior, the ranger told us a woman fell off the falls we were swimming in the day before and died, just a couple hours after we left! It is amazing how people are so concerned about bear attacks and other wildlife, but forget that they need to be careful near 300 foot cliffs with fast moving water flowing over them. 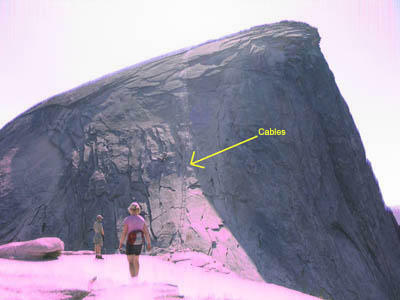 Eventually we were allowed to head up Half Dome. There were about 30 people waiting to head up, but we managed to spearhead our way to the front of the group. It was easily the most difficult leg of the hike. Stairs stretched up as far as could be seen over the curve of the rock and it did not take long before my legs were burning. After the stairs came a 40 degree sloped rock to walk up for a couple hundred feet before we reached the famed "cables." 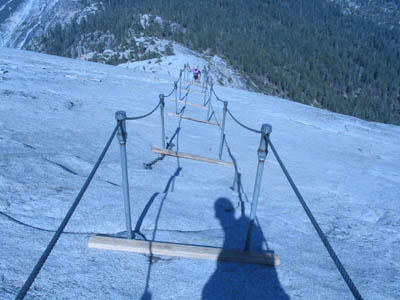 The cables are used as hand rails to keep you from plummeting to your death as you climb the 50+ degree slope of Half Dome. If it weren't for the fact that we had been hiking all day and breathing thin air, it probably wouldn't have felt like we were going to pass out. Unfortunately, we had been hiking all day in thin air. Reaching the top felt great. We could see the whole park in all its glory. It made the whole grueling hike worth it. Since we had such a late start, the last couple hours of the trip back to camp were in the dark, but the flashlights kept alive long enough to get us back safe and sound. Oh, my gosh! I'm weak knee'd just looking at the pictures, but it certainly doesn't stop me from wanting to do that someday! Wow... sounds incredible! You should definately do it! You would love it! It is a rough hike, but well worth the effort! Great post. I was captivated. Very descriptive without overdoing it. Sweet. 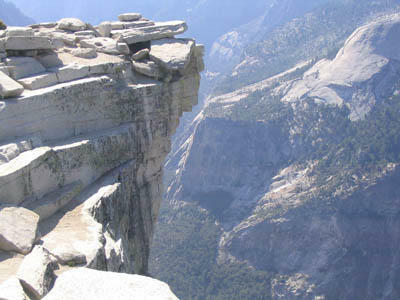 I now want to go to Yosemite. I get a bit carried away writing sometimes. Yosemite must be visited by one and all. It is a site that must be seen!